Chembra Peak is one of the highest lush green peak in the Western Ghats and the highest peak in Wayanad hills, situated at 2,100 m above sea level. It is located near the bumbling town of Meppadi and is 8 km south of beautiful town Kalpetta. The ravishing peak provides panoramic view of the Wayanad District and view of some parts of Kozhikode, Malappuram and Niligiri districts. Chembra Peak is one of the most popular trekking points in the Wayanad district. 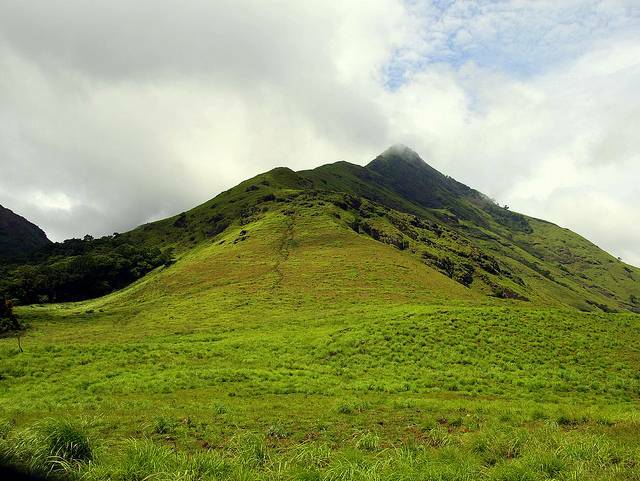 Chembra Peak is the highest peak of Wayanad and has been the hub of all avid trekkers and nature lovers. This peak is a paradise for trekkers who want enthralling trekking experiences in low cost and high energy. On the way to this peak, you can see a heart shaped lake, which is said to have never dried up. There is a lake and a clear view of the dipping hills. Once on the top of the peak the feeling everybody experiences is simply enthralling. Banasura Sagar Dam and Banasura hill are also nearby and are mesmerizing. The District Council of Chembra Peak provides guides and trekking equipment on hire charges to tourists. It will take about 3-4 hours to reach to the top point of the mesmerizing Chembra peak. It is also a paradise for photographers who want to capture the abode of clouds and green plants. Resorts are available in the area though it may be a good idea to call ahead. Camping is also possible and advice can be sought from the District Tourism Promotion Council. Camping at Chembra peak is organized by the district authorities. Do indulge in this once in a life time experience. Click as many pictures as you can, there will be many moments you would like to carry home. If you admire soothing and exquisite natural beauty and love enthralling and fun loving adventures, then Chembra Peak is a perfect spot for you.